HubSpot’s COS is able to load pages and files at high-speed and protect your site against malicious attacks (like DDOS), but the technology that enables this will only work with the WWW version of your domain. You can redirect your root domain to the WWW version, so that visitors will always be able to get to your website, regardless of thow they type your domain. 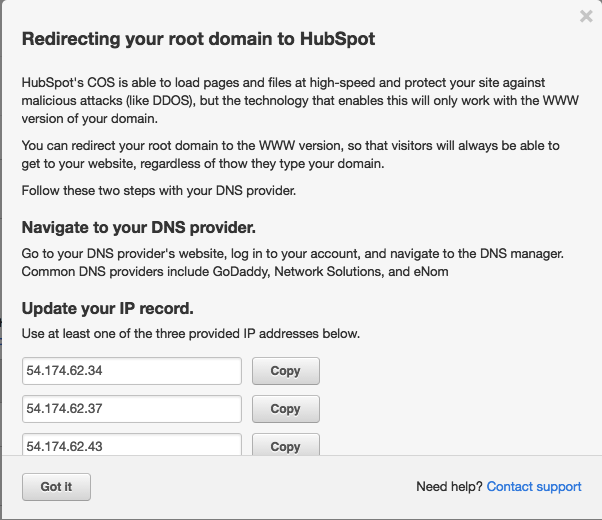 Follow these two steps with your DNS provider. Navigate to your DNS provider.